MainAll NewsInside IsraelWho torched Israeli synagogue's Torah scroll? Who torched Israeli synagogue's Torah scroll? Worshippers at synagogue in Israeli coastal town of Hadera horrified to find Torah scroll stolen and torched. Worshippers at a synagogue in the Israeli coastal city of Hadera were shocked to discover Sunday morning that one of the congregation’s Torah scrolls was destroyed overnight, after being removed from the building. The Torah scroll was stolen from the Great Synagogue in Hadera before morning prayers on Sunday, and set on fire in a nearby garbage can outside of the synagogue. Members of the congregation altered synagogue officials after they smelled smoke as they made their way to the building. 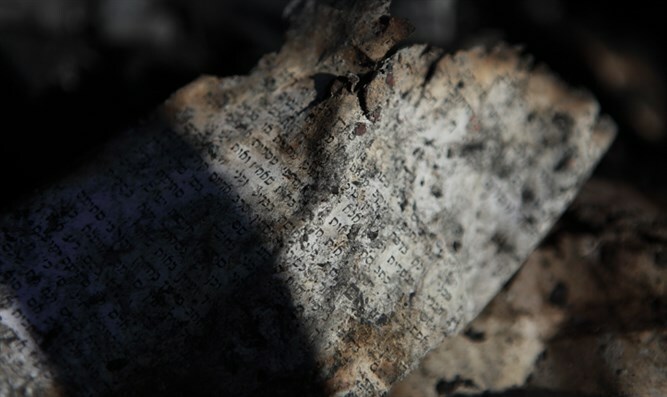 When the synagogue’s gabbai, Roni Rimmer, went out to investigate the source of the fire, Behadrei Haredim reported, he was stunned to discover a Torah scroll burning in a garbage receptacle. According to the synagogue’s rabbi, Rabbi David Yehiel Werner, the Torah scroll had been worn out after years of use, and was no longer kosher. As such, the scroll had not been stored in the synagogue’s Torah ark with the congregation’s other scrolls, which were not damaged. Synagogue officials filed a report with police Sunday, and an investigation into the incident has been opened.